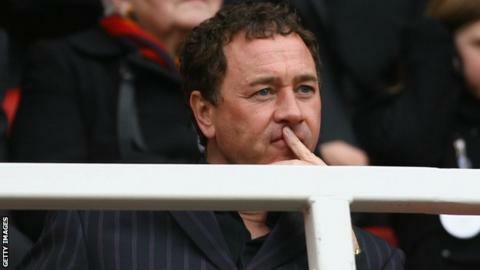 Middlesbrough chairman Steve Gibson says he plans to make changes in "all aspects" of the club after their relegation from the Premier League. Boro's drop from English football's top tier was confirmed with a 3-0 defeat by Chelsea on 8 May. Speaking to BBC Tees, Gibson admitted that key decisions made at the top level contributed to their downfall. "The fact that we haven't fulfilled our objective tells you we've made mistakes," said Gibson. "It's heartbreaking really. The season's been really tough. You make decisions and your mistakes are a retrospective view of the decisions you make. "At the time we thought we were making the right decisions with the information that we had but many things have gone wrong." Aitor Karanka's three-and-a-half-year tenure as Middlesbrough boss ended in March after a winless run of 10 Premier League games, but Gibson says he will not blame any particular individuals for their failure as he plans his shake-up of the club. "We had some disruption from the management side during the season and it has affected the players," he said. "Our plans are to change all aspects of the club. We have spent the last month looking at what we've done this season, how we've done it and what could be better. "I've got to be careful because it will affect others who are currently within the club. We have to get it right. "Collectively, responsibility lies through me and right the way through the club. We failed and we don't need telling that we've failed. It hurts but we have to correct our mistakes now." Gibson, who dismissed reports of a £50m takeover bid by a Chinese-American consortium as "laughable", added that a decision about the club's managerial position has not yet been made. Karanka's former assistant, Steve Agnew, has held the role since the Spaniard's departure. "There was never anyone lined up (after the sacking of Karanka)," said Gibson. "I think the world of Steve Agnew. He's worked for this club for a very long time and he was the player's choice as well as my choice." Once it has decided on the roles he wants people to take at the Riverside, Gibson hopes his plan will lead to a triumphant return to the top flight. "There's only one place I want for this club and it's in the Premier League," he said. "The club is well run and we're in a good financial state so we will have more resources going into next season than any other Championship club. "We will smash the league next year. We want to go back up as champions."